Just in case you forgot how many days remain until the unveiling of the OnePlus 6, OnePlus has disseminated a tweet containing a video that will remind you. The video shows the number 3 in neon, and just before the ten second clip is over, the number flickers and quickly changes to a 6 before switching back to the previous number. 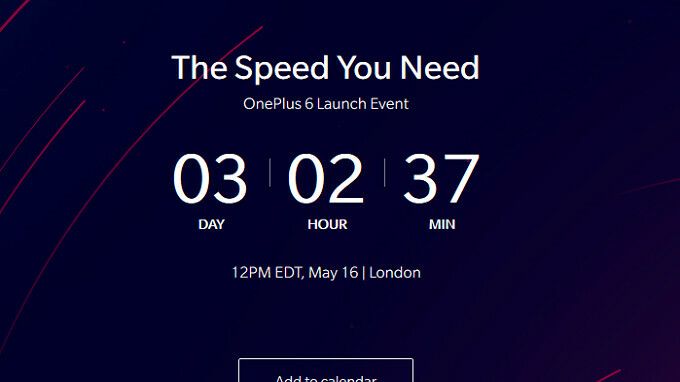 On May 16th, OnePlus will unveil (as one phone manufacturer might say) "the best OnePlus yet." The event is being held in London, and starts at 12 noon EDT time in the U.S. The OnePlus 6 will feature a 6.3-inch AMOLED screen with a resolution of 1080 x 2280 for an aspect ratio of 19:9. The Snapdragon 845 mobile platform will be under the hood, and the phone will be equipped with up to 8GB of RAM and as much as 256GB of native storage. A dual-camera setup is expected on back (16MP + 20MP), and a 3450mAh battery will keep the power on. For the first time, OnePlus will have an IP 67 certification rating allowing it to be submerged in water up to 3.3-feet for as long as 30 minutes, and emerge unscathed. OnePlus has come a long way and is about to offer a device that it thinks can hang with the Apple iPhone X and the Samsung Galaxy S9, but at a cheaper price. Is OnePlus right? We will start to learn the answer to that question this Wednesday. Really. I’ve bought the 3t and the 5t. I really wanted to like both, but ended up selling both shortly as they were just to big for everyday carry, very clumsy one handed, and just too big for day to day life. It never let me forget it was in my pocket. If I need two hands to operate, I might as well use a tablet. Good looking phone though. Really? I'm Asian and I have small hands and of average height...but I don't think the 3T and 5T are that huge. Yes, they have weight but personally, I like phones with a little heft to it. Agreed. It would be nice if OnePlus had a smaller variant with the same specs. 5.5" screen with the 19:9 screen would make for an Essential Phone/iPhone X sized device. I'd consider that over the larger variant, even at the same price point. If you turn on the feature that adds black bar to blend the notch, then the screen becomes 18:9. Is there a countdown until their next notchless phone is released? I’d just get a Huawei P20 Pro if i was buying Chinese jank sh*t. Otherwise, Samsung and Pixel (LG) are the way to go. Every year the same thing. Then we hear about the queue at the stores behind the phone.